The summer before my senior year in high school, I worked as a file clerk in the accounting department at my dad's company. 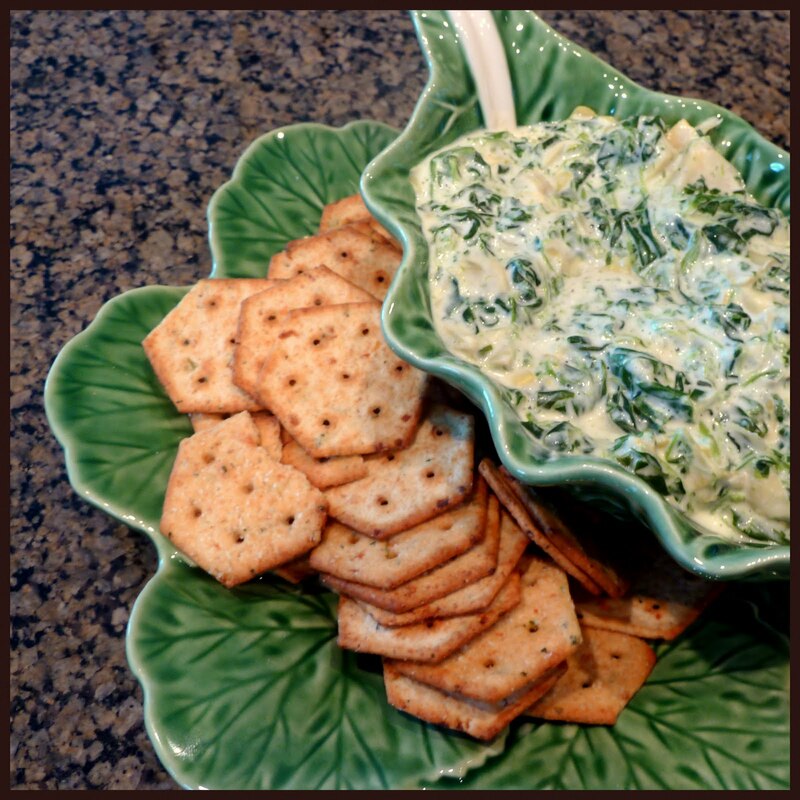 The job was terribly boring, but the experience provided me with a really nice recipe for spinach and artichoke dip. Our payroll clerk brought a big bowl of this spinach and artichoke dip to every office party and it's delicious. This particular recipe is different than most because it doesn't have any mayonnaise or sour cream in it. Instead of being slightly tangy, the flavor is soft and mild. The dip is cheesy and creamy and very good. The recipe is simple. You stir together cooked spinach, chopped artichoke hearts, cream cheese, and Parmesan cheese and heat it gently until everything melts together. The cream cheese makes the dip soft and smooth, and the Parmesan gives it a nice sharp, salty flavor. Tortilla chips, wheat crackers, or thin baguette slices all make nice accompaniments. Adapted from a recipe shared by Robin Roitz. Makes about 2 cups. Begin by steaming the spinach over low heat in a covered saucepan with a little bit of water until the spinach is soft, about 5 minutes. Drain the water from the pan and press a spoon against the spinach to squeeze out any additional water. Give the artichoke hearts a rough chop and add them to the saucepan with the spinach. Mix in the cream cheese and Parmesan cheese and stir over low heat until all of the cheese is melted and fully incorporated. You can stop there and get right to the eating, or you can spoon the dip into a crock or a small, shallow casserole dish and bake it in a hot oven until it's bubbling. The dip is best served warm, but you can also serve it at room temperature if you thin it with a little bit of milk or water. A clove or two of minced garlic is a nice addition if you want a little kick. 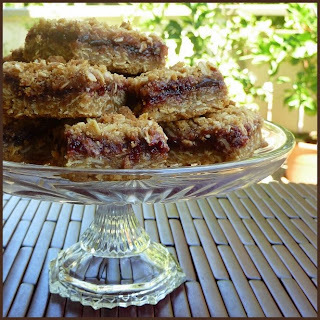 I've made batch after batch of cherry bars this summer, and they always seem to hit just the right note. Their rich fruit flavor and crumbly, buttery crust make them a pleasure to eat. And, their tidy, portable form makes them perfect for picnics. No fork or spoon required. I grew up in Colorado, and before I moved away I discovered this cherry bar recipe in a Junior League of Denver cookbook. As far as I can tell, nothing about these bars has anything to do with Colorado, but I like the "Colorado" in the original recipe name because it makes me think of home. Today (this very day! ), my brother is moving back to Colorado, and I've decided to mail him some cherry bars as part of a housewarming care package. These bars are great because they take only about 5 minutes to put together (plus another 30 minutes to bake), and with the exception of the cherry preserves, the ingredients are all pantry or refrigerator staples. So, if you're careful to always keep a jar of good cherry preserves on hand, you can throw together a batch of these sweet, tasty treats at a moment's notice. The starting point for the recipe is a crumb mixture made of oats, flour, and brown sugar, mixed with lots of melted butter. Some of this mixture gets pressed into the pan to form a bottom crust and the remainder is used as a crumb topping. Cherry preserves form the middle layer. The bars go into the oven until the top is lightly browned and the cherries are bubbling through to the surface. The key to making this recipe outstanding instead of just pretty good is using high-quality cherry preserves that are slightly tart and filled with lots of whole fruit. I like Bonne Maman preserves, which seem to be available at most grocery stores. Cherries are the best fruit for this recipe because of the way their tartness counterbalances the very sweet crust, but other fruits work well too. Blueberry, peach, or strawberry preserves all produce nice results if you stir in a just a little bit of lemon juice or balsamic vinegar for added zing. Adapted from Colorado Colore: A Palate of Tastes by the Junior League of Denver. Makes 16 bars. Preheat the oven to 375 degrees. Melt the butter in a saucepan and set it aside to cool slightly. In a large mixing bowl, stir together the flour, baking powder, and salt. Add the oats and brown sugar and stir to mix. Pour the melted butter into the mixture and stir first with a spoon and then with your hands until the mixture is moist and crumbly. Press 2/3 of the crumb mixture into a greased 8x8-inch pan. Spread the preserves over the surface of the crust, leaving a 1/4" border around the edge of the pan (to prevent the preserves from bubbling out to the edges, where they will burn and stick). Sprinkle the remaining 1/3 of the crumb mixture over the top. Squeeze the crumbs together as you take them from the bowl to give the topping a texture like small pebbles. Try to cover the fruit entirely with the crumb mixture, if possible. Bake for about 30 minutes, until the bars are brown and bubbly. Cool completely, then cut into squares.